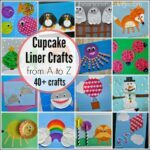 Ever since I discovered how fun it is to make crafts with cupcake liners they have been a staple in my craft closet. 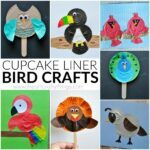 We’ve made some darling birds in the past and today I am adding to those with this cupcake liner toucan craft. It is definitely a new favorite! It’s simple to make and the brightly colored beak gives the craft such a fun pop of color. 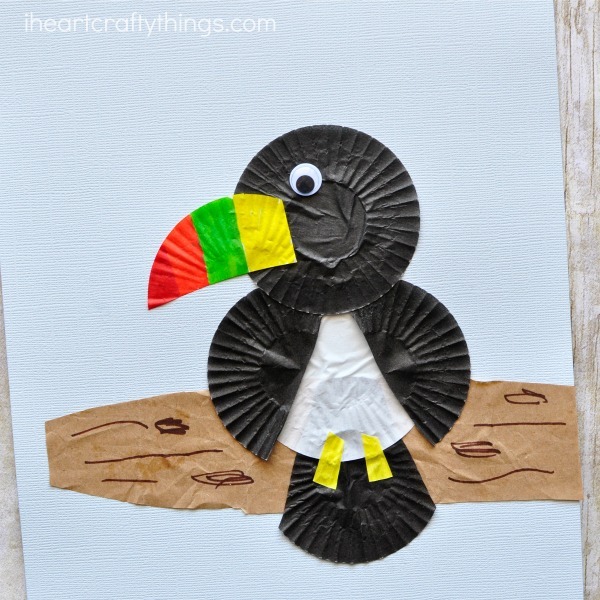 Go grab some black and white cupcake liners and get ready for an afternoon of fun making this cute toucan craft. 1. 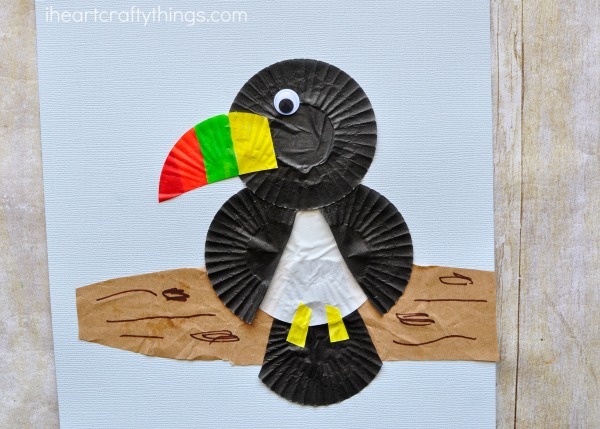 To make your toucan craft you will need three black cupcake liners and two white cupcake liners. Flatten out all of the cupcake liners. 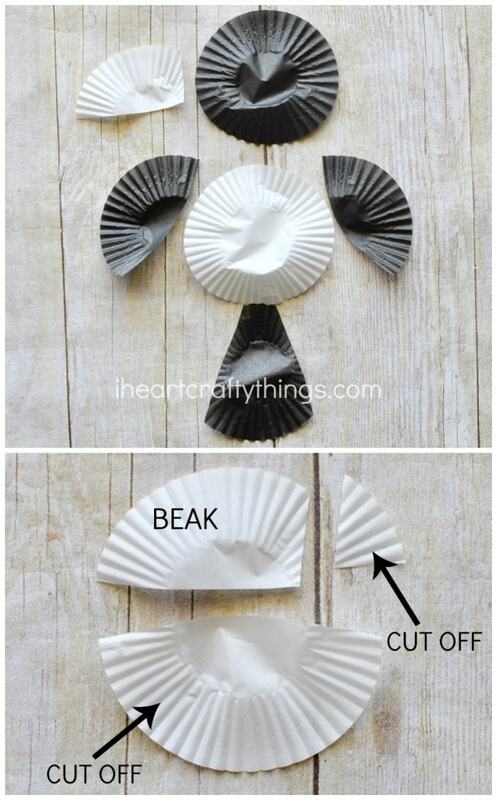 Cut one of the black cupcake liners in half. Then cut the sides off of one of the liners for the tail feathers. (See picture below). 2. To make the beak, cut about 1/3 off of one of your white cupcake liners. Then cut the end off of that section to make one side flat. See picture above for reference. Use your markers to color your toucan beak. 3. Cut out a tree branch from your brown paper lunch bag and glue it onto your light blue cardstock paper. Draw wood markings onto the branch if you’d like. 4. Now assemble your toucan. Start by gluing on the tail feathers then the white body. Next glue your two wings on and then your toucan face and beak. 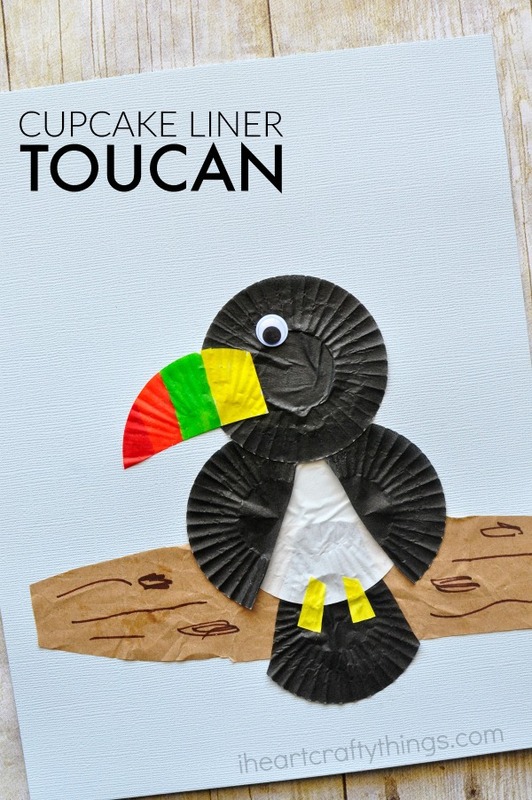 Cut feet out of a yellow cupcake liner (or construction paper) and glue them at the bottom of the toucan body. 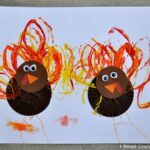 Finish your cupcake liner toucan craft by gluing a googly eye onto the face. These are so cute. I am going to try them with my daycare kids! !